Mount Bulusan erupted at 9:33 Tuesday morning spewing ash clouds 6,000 meters into the sky as thousands of residents scampered for safety, authorities said. It was a phreatic type of eruption characterized by a massive emission of volcanic ash accompanied by an explosion-type of earthquake detected by seismographs at the Phivolcs observatory at Barangay Cabid-an in this provincial capital. There were no report of casualties, but Sorsogon City Mayor Sally Lee went over the radio to call on local folks living near the four-kilometer permanent danger zone to evacuate. The residents of the entire Sorsogon province were told to be prepared for a full day of volcanic activities, which would require ample protection from all sorts of danger posed by the eruption of Mt. Bulusan, which is about 250kms south of the capital Manila. Rolando Guardacasa, Phivolcs resident volcanologist, said that with ash fall expected to last the whole day, the residents must make handy a piece of wet towel which they may use to protect themselves from possible bronchial ailments spawned by the phenomenon. He also warned of the danger that the volcano would spew a volume of lava and lahar that could bury entire villages in the even of rain and floods. Bella Tubianoza, resident volcanologist, said the eruption and explosion-type tremor occurred simultaneously and continuously, lasting for 10 minutes starting at 9:37 a.m. The incident was considered the most significant activity of Mt. Bulusan since it started acting up last March although alert level one over the volcano was maintained, Tubianosa said. "We expected a big bang but we did not know when it would come. Mt. Bulusan had this capability based on its history," she said. 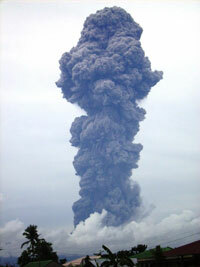 The eruption was viewed in full at this city, over 30 kilometers from the volcano. While most residents were awed by the spectacular show of cauliflower-like column of ash, some panicked in fear. The explosion was seen as far away as Catanduanes and Albay provinces. Residents in the town of Juban were told to leave their homes in anticipation of lava flows. Government relief agencies were immediately mobilized to assist in the evacuation. Since the volcano spewed an ash column that went up some six kilometers high, the shaking of the earth is said to have become stronger and more often. The Provincial Disaster Coordinating Council (PDCC) was immediate mobilized and the Department of Social Welfare in Sorsogon has started coordinating with education officials for schoolrooms where the evacuees may be given temporary shelter. The National Food Authority (NFA) provincial office also gave assurances that there is ample rice stocks.